I am actually really happy with the way these guys have turned out! So allow me to walk you through the different members of the squad and take a closer look. 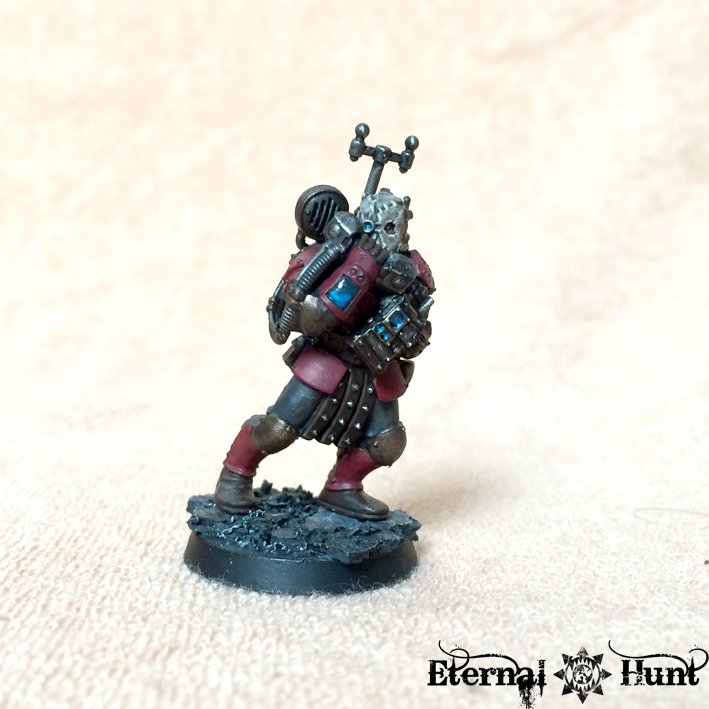 As you can see, this is basically a Tempestus Scion with some tastefully applied spiky bitz 😉 This was my first actual test model for an elite traitor Stormtrooper, and I think it works: The horned helmet may not be to everyone’s taste, but I think the guy really looks like a tough as nails elite trooper in the archenemy forces. 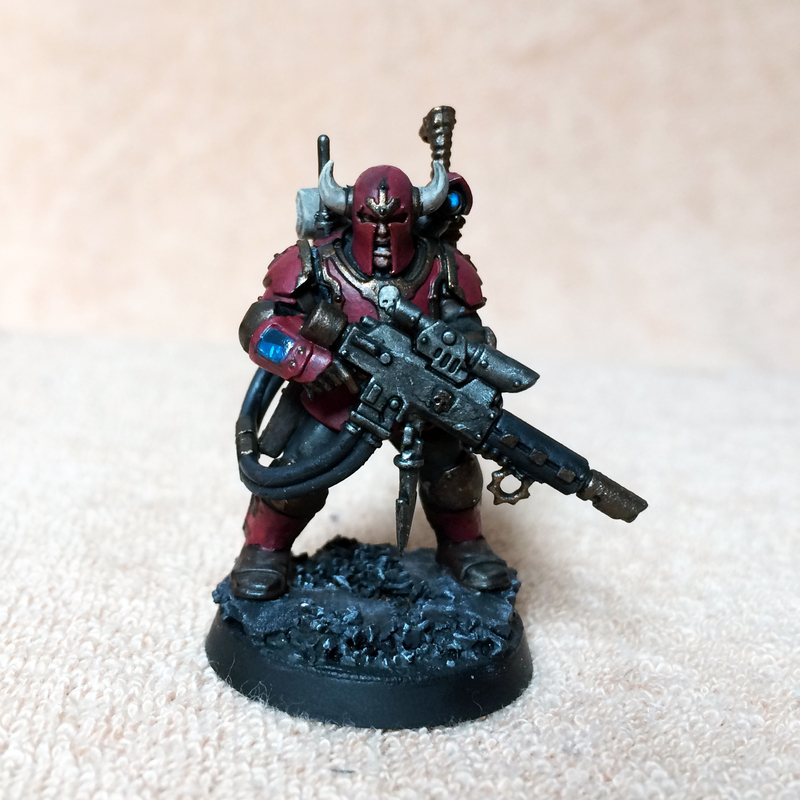 As for the colour scheme, I knew I wanted to use the same general colours as in the rest of my Traitor Guard detachment: Mainly dark grey, crimson and brass (with silver and brown for the medals and leather parts, respectively). 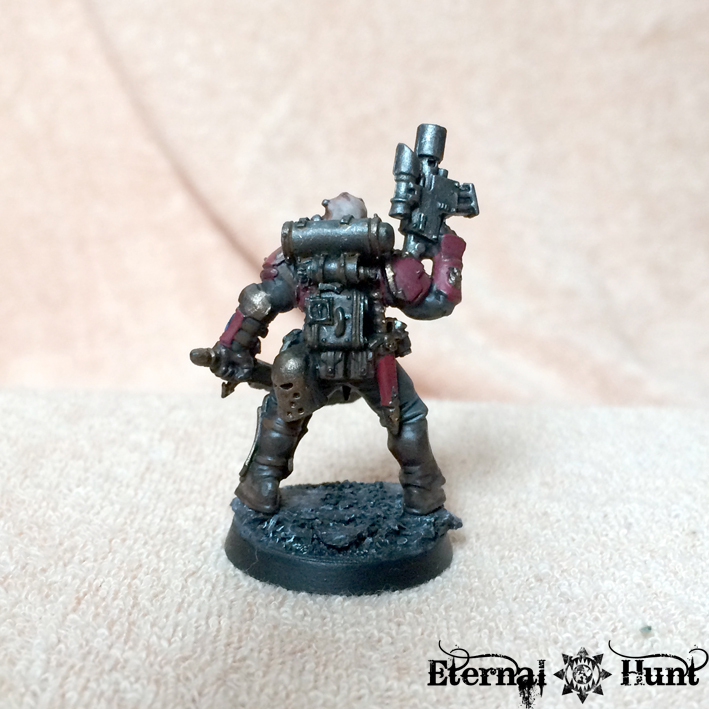 All of my traitors are wearing dark grey fatigues in one form or another, so I repeated that here. In order to show that these guys are the cream of the crop, however, and far more heavily armoured than the rank and file troops, I chose to expand the use of red, painting all the armour plates with it. 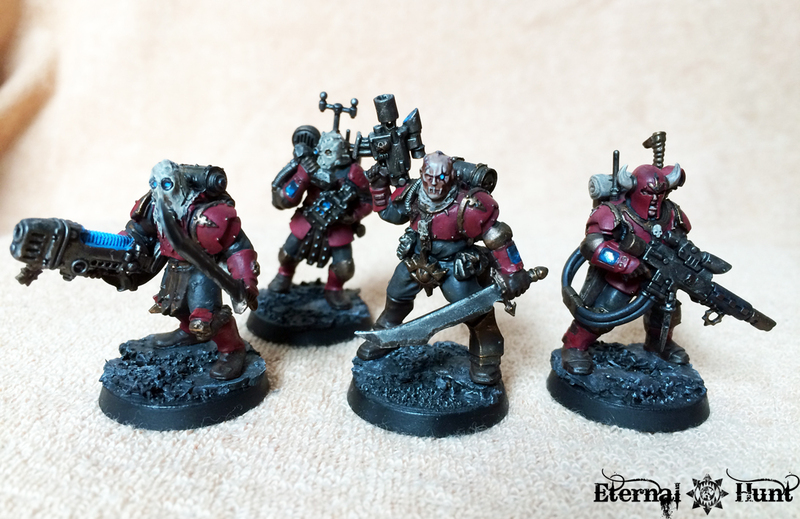 The result is a colour scheme that still looks like it belongs to my Traitor Guard but provides some contrast for these guys. 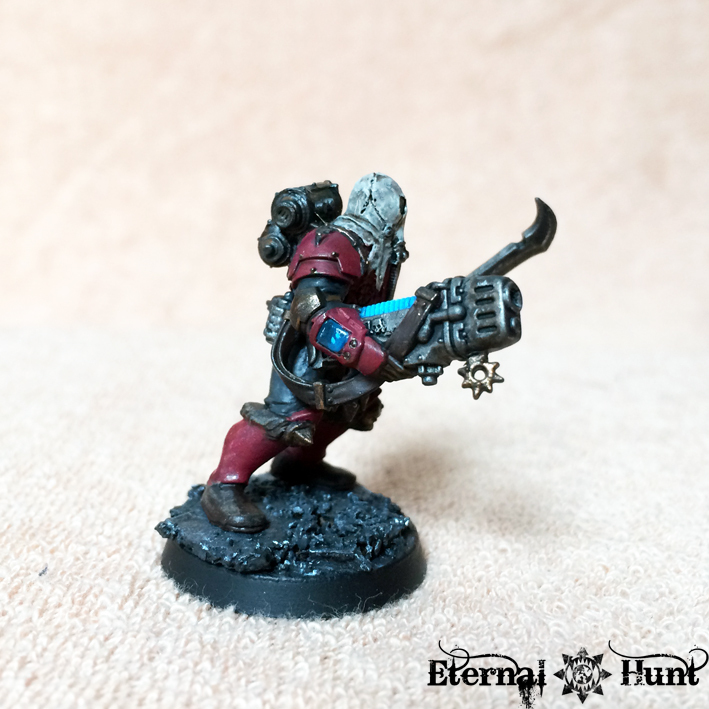 The model only uses a right arm from the Tempestus Scion kit. The rest of the bitz came from the Vraksian Renegade militia, the Chaos Marauders and Space Marine Scouts, respectively. Oh, and I used a Skaven speartip in order to create a suitably nasty looking sword. 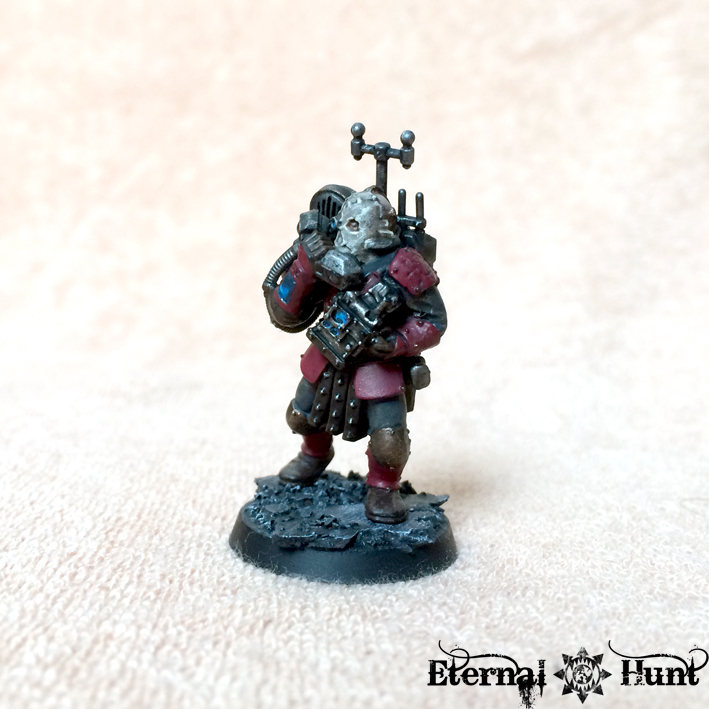 My plan is for the models in the squad to use different combinations of bitz from the same four or five kits, with certain elements (such as the paintjob, the use of scion shoulder pads etc.) creating a feeeling of cohesion, even if the models themselves are looking slightly different. The chaos warrior sword the model wielded in its earlier incarnation was replaced with a nasty, curved Goblin sword for example: I think a vicious, slightly primitive weapon is just a far better fit for a traitor officer. I also added a bundle of Imperial dog tags on the officer’s belt, which makes for a nice bit of visual storytelling, if you ask me. 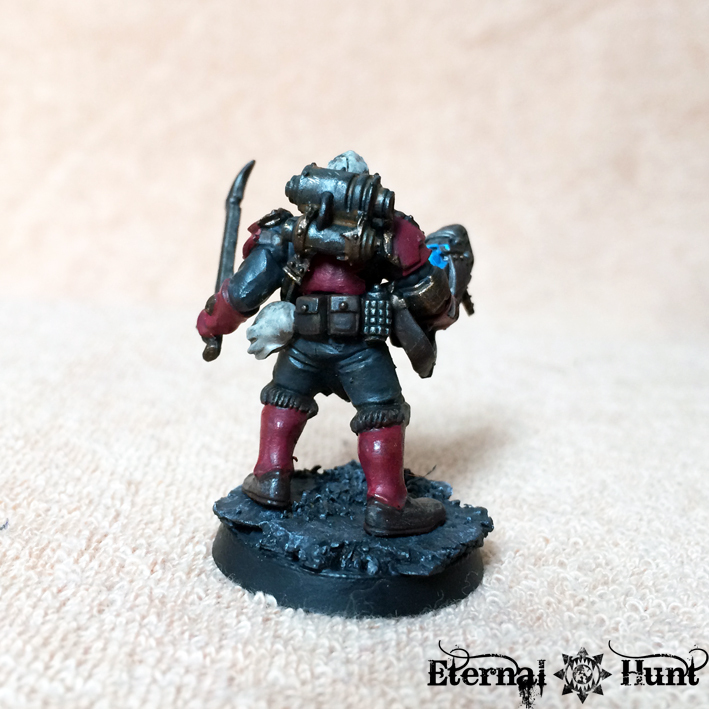 This model was actually the first member of the squad I painted. 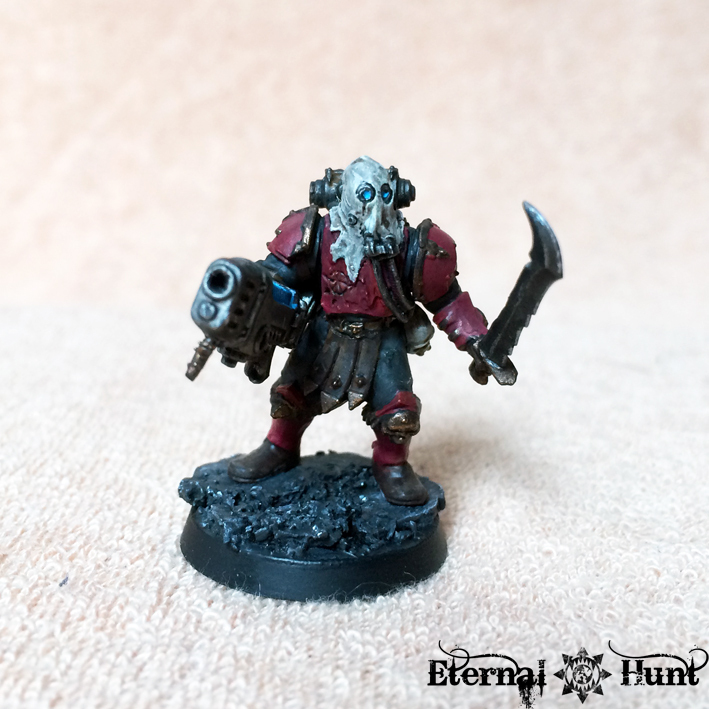 And I really only started on the rest of the models because I was so happy with him: In a way, he perfectly embodies what I think Traitor Guard should look like, and if I were to completely re-do Urash’s Marauders today, I suppose he would become my template for the entire project. 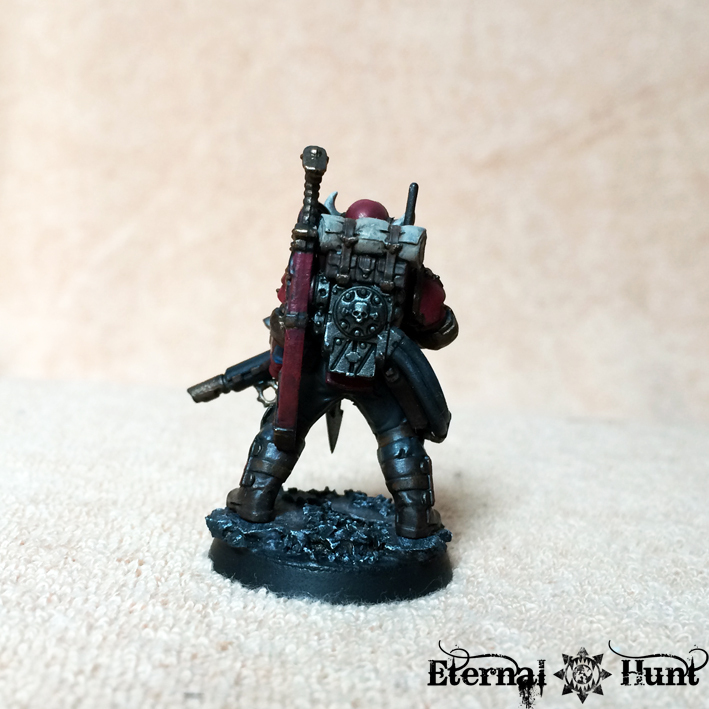 This entry was posted on November 26, 2014 at 09:00 and is filed under 40k, Chaos, Conversions, paintjob, Traitor Guard with tags 40k, chaos, conversion, counts as, kitbash, lost and the damned, marauders, paintjob, renegade militia, renegades, tempestis scions, traitor guard, traitor IG, traitors, Urash's Marauders. You can follow any responses to this entry through the RSS 2.0 feed. You can leave a response, or trackback from your own site. I think I need to pick up one of those Scions kits. These traitors look so cool. Thanks a lot, Waaaghschale! The scions are an excellent kit, and very much worth the price. Do my eyes deceive me? I think I see painted models! 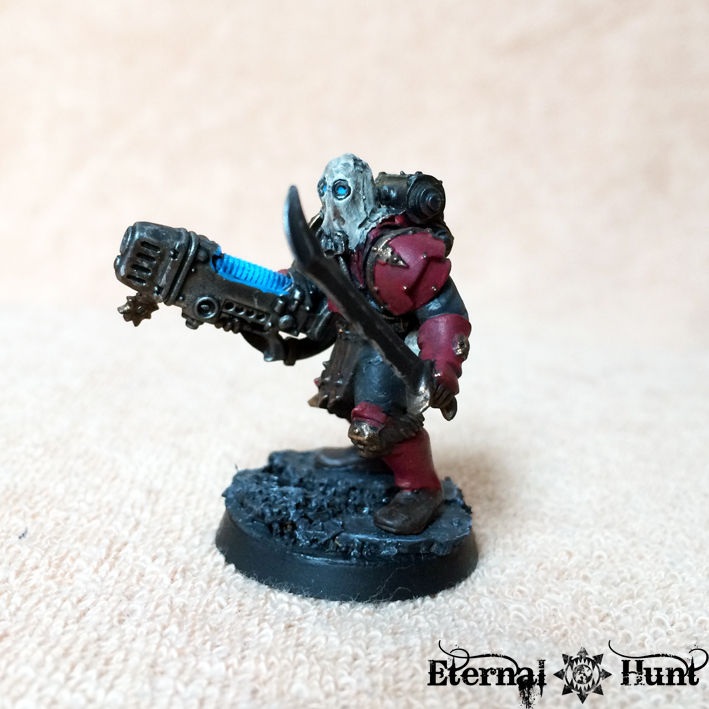 The color scheme looks very nice with the dulled reds. Leaves great contrast with the plasma weapons and the arm gauges (I guess that’s what they are). Seriously, though: Thanks for the kind words. I am pretty happy with the colour scheme myself. Solid work. The use of WoC legs is a nice touch. 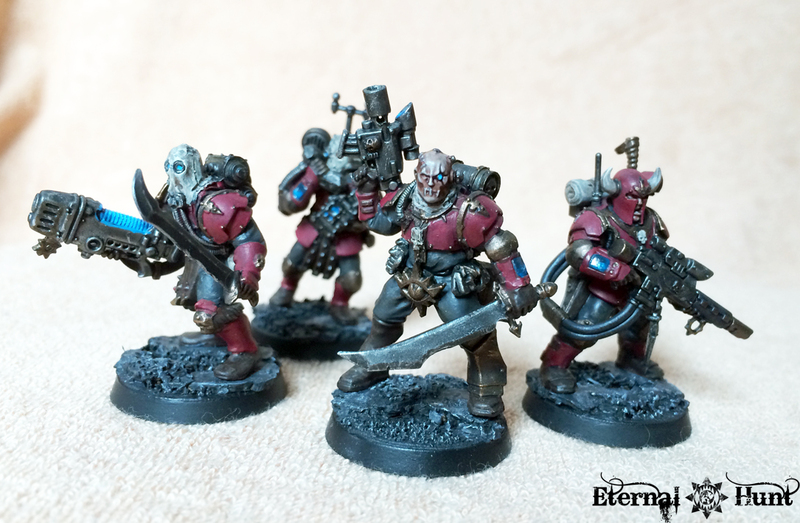 Beautifully done – those are some brutal looking traitor guard! 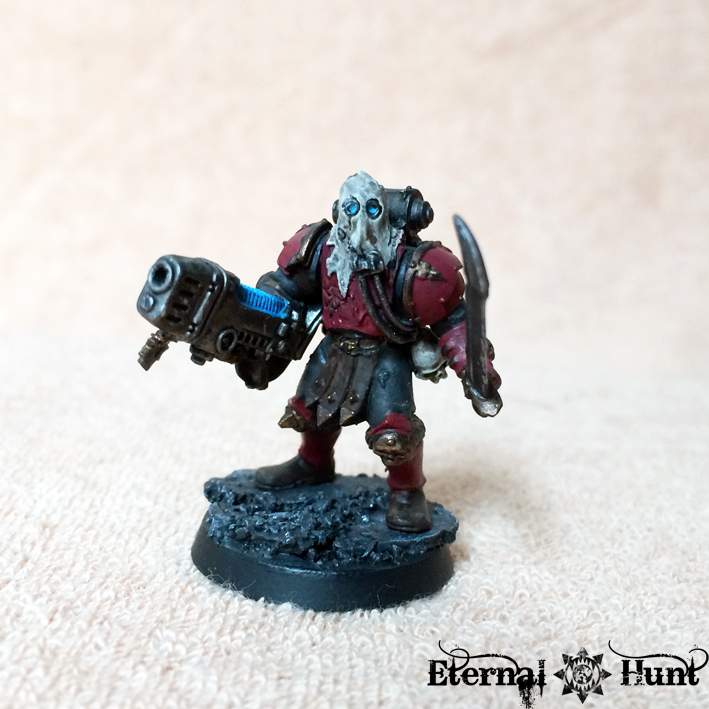 Wow these are great, I bought a scion kit last week, but I’m only planning to use the tempestor prime model (as an Arbites judge- rules wise an inquisitor with null rod). 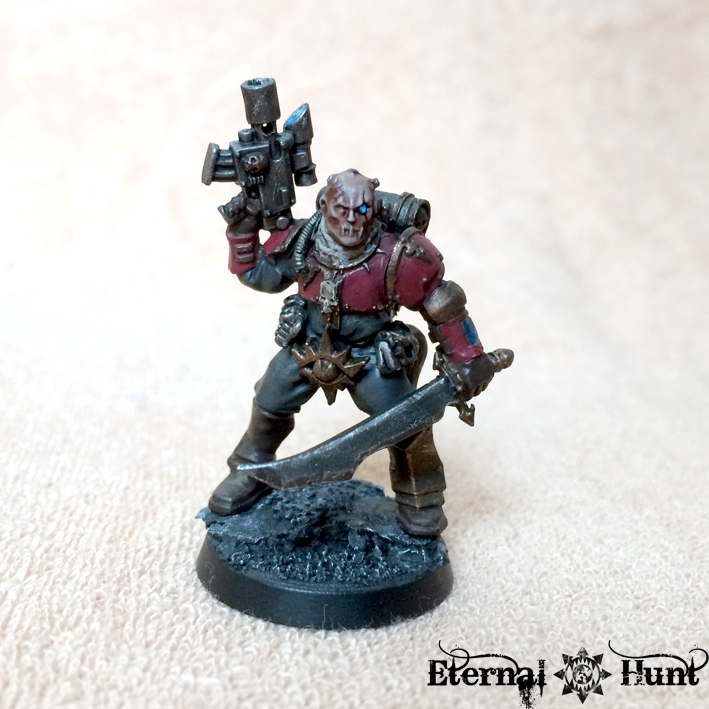 I also want some tauroxes for my Arbites army, so I was considering getting the Scions bundle box but wasn’t sure what to do with 25 extra scions (I built my Inquisitorial Scions from dreamforge storm troopers). But then I remembered, the Bloody Handed Reaver from IA13 allows you to take grenadiers with BS 4, hotshot lasguns and carapace armor. 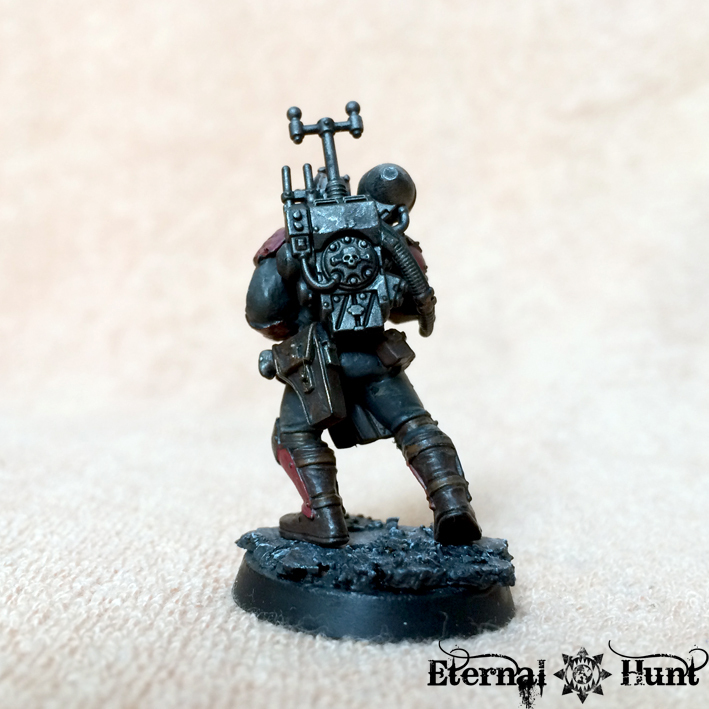 I’m planning on making that the backbone of my traitor guard. These are brilliant! The colour scheme works really well. 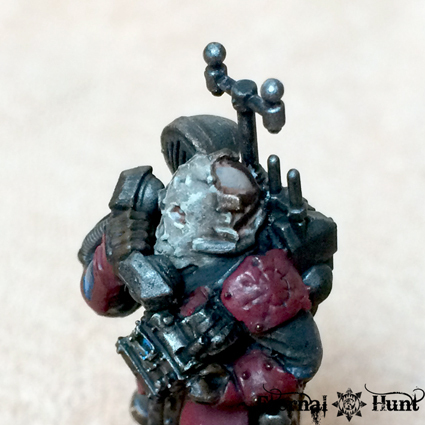 The squad leader is my favourite and I think I will have to nab the Chaos helmet idea too. Works well. Thanks! 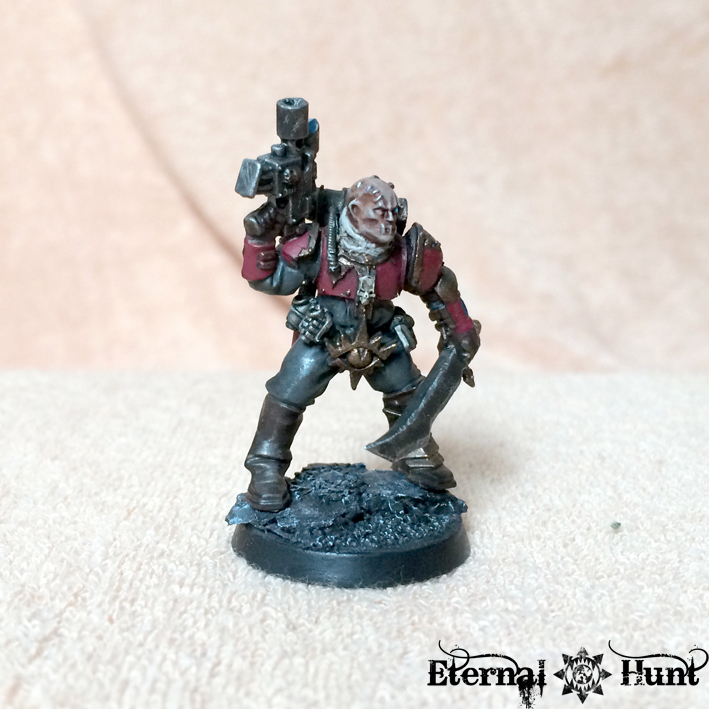 The squad leader is possibly the best Traitor Guard model I have come up with yet. The guy was heavily inspired by PDH’s wonderful traitors, so make sure to check them out as well!